BMW has also released new details for the iX3 and iNext EVs. It’s no secret that BMW is planning an EV onslaught, with 12 new electric models debuting by 2025 including the iNext, iX3, and i4. We’ve seen camouflaged prototypes of all three models, but now BMW has released the first technical specifications for the upcoming EVs as extensive testing begins at BMW’s winter test center in Arjeplog, Sweden, to make sure components such as the electric motors, batteries and the power electronics can withstand cold-weather temperatures. We’ve already seen the BMW i4 prototype in spy photos, but this is our first official look at BMW’s upcoming Tesla Model 3 fighter. BMW says the four-door coupe is positioned in the premium mid-range segment and "combines a dynamic design with inspiring performance and a high level of ride comfort.” Debuting the company’s fifth-generation BMW eDrive technology, the i4 will deliver a range of over 372 miles based on the new WLTP cycle, while the electric motors will enable the i4 to sprint from a standstill to 62 mph in a mere 4 seconds and reach a top speed of over 124 mph. Production of the i4 will take place at BMW’s Munich plant starting 2021. BMW’s flagship iNext electric SUV will also offer a driving range of more than 373 miles, although it’s worth noting that BMW previously said it was targeting a range of 435 miles. The iNext will also incorporate Level 3 autonomous driving and the latest connectivity features when production begins at BMW’s Dingolfing, Germany, plant in 2021. Before the i4 and iNext arrive, the iX3 SUV will launch next year and deliver a range of over 249 miles. 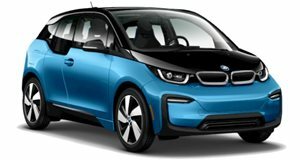 Thanks to the company’s fifth-generation eDrive technology, BMW’s first fully electric "sports activity vehicle” will feature "an exceptionally powerful electric motor and a high-voltage storage unit featuring state-of-the-art battery cell technology.” The battery can also be charged at DC charging stations with a capacity of 150 kW to charge its battery, making the iX3 ideal for day-to-day use and long-distance travel. The BMW iX3 will be built at BMW Brilliance’s Shenyang plant in China for the global market.